While I don't think we will ever be big fans of the "light in sodium" soups, Amy's offers such a wonderful assortment of full-flavored varieties that it's near impossible to get bored. We gave two thumbs up to the Thai Coconut, Tuscan Bean & Rice and Vegan Tomato Bisque, and love the whole food, "just like homemade" focus of this brand. To this day, I think of Amy’s Kitchen as the darling of the natural food industry. As conglomerates gobble up everything in site, Amy’s has remained a family-owned business and become the nation’s leader in natural frozen foods. But their shelf-stable items should not be forgotten. Amy’s Organic Soups include a diverse selection, all of which are vegetarian and most are dairy-free and vegan, too. To note, Amy’s Organic Soups are made with whole, minimally processed ingredients, so they have naturally occurring nutrition, from fiber and protein to vitamin A, vitamin C, iron, and calcium. This was my most recently sampling, and I was impressed. Amy’s has a tomato bisque with milk, but they’ve since released this vegan variety with a touch of coconut cream for richness. The flavor is bold, yet pure and perfectly salted. 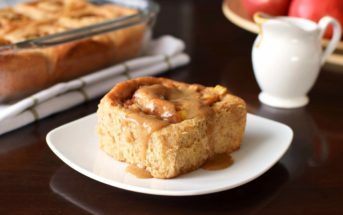 I found it to be just a touch too sweet (they really could tone down the organic sugar added), but it tempers well with add-ins or bread for dipping. This soup has a heat that sneaks up on you … the kind that makes you keep eating, quickly, to keep it from catching up with your taste buds.I loved the flavor, though my timid taste buds couldn’t continue to eat this soup straight up. To tame the heat, I made a meal for two out of the single can, pouring it atop two bowls filled with a base of brown rice and steamed sweet potato chunks. 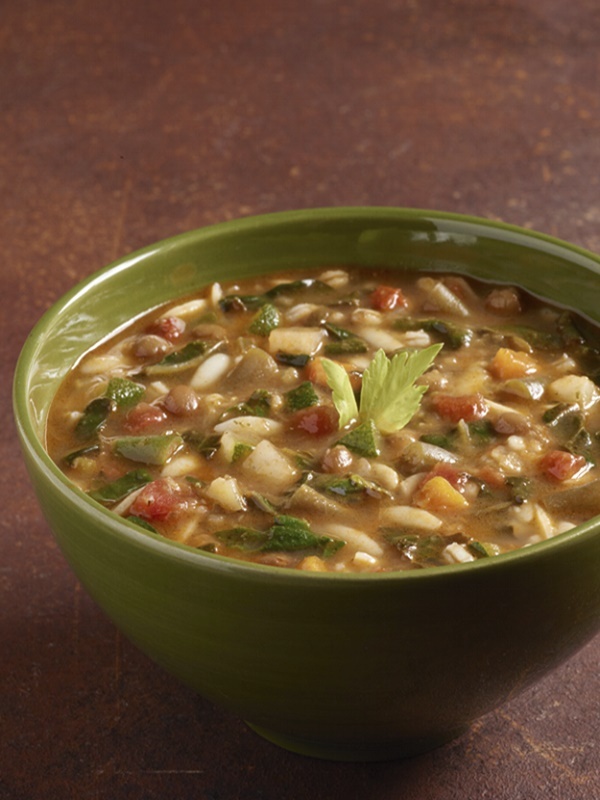 The soup itself contains black beans, potatoes, carrots, and corn all in a spicy, tomato base. On its own, if you can handle the kick, the entire can would make a good light meal for one. While both Tony and I enjoy butternut squash, anything involving a puree typically reminds us of baby food. Plus, while butternut squash itself has a light sweetness, most brands of butternut soup tend to load up the ingredients with syrupy sweeteners. Fortunately, Amy’s remedied both of these issues by thinning the squash to a smooth and soupy consistency, and only adding a hint of evaporated cane juice. The sugar enhanced the natural sweetness without overloading my taste buds. That said, the overall flavor is just slightly lacking… something that perhaps just a pinch of cayenne would fix. Sadly, my first thought was, “hmm, needs salt.” Resisting the urge I reached for the pepper grinder instead. Both Tony and I thought this was a good move. While I often find Amy’s Chili (even the medium) a bit too spicy, this soup was on the bland side and lacked zing. Even after the peppering, the soup was still shouting for an additional herb or spice, but I couldn’t quite make out which one. Cumin? Paprika? Rosemary? Perhaps some future experimentation will tell. Beyond the flavor, I liked the heartiness of this soup. Rich with lentils, and light on liquid, I could easily fill up on a whole can. But instead, I served it over brown rice, making a little lunchtime meal for two. This was a meal in a soup! A generous hand with the coconut milk makes this soup rich and provides a flavor base that is reminiscent of mild curry – perfectly warm and lightly spicy. In terms of consistency, it was mostly soup, with just a few bits of sweet potatoes, green beans, shiitakes, and meaty tofu to break up the fluidity. Since the additions were sparse, I added some cooked brown rice, a small diced and steamed sweet potato, and a cup of spinach. It was a perfect match with Thai restaurant-quality goodness. While I love to make my own curries and coconut soups, this is a worthwhile shortcut purchase for a quick and easy dinner. Note: The Thai Coconut soup is made with organic ingredients, but unlike the others, it isn’t certified organic. We’ve still got so many dairy-free Amy’s Organic Soups to sample … Minestrone (pictured below), Chunky Vegetable, No Chicken Noodle, Hearty French Country Vegetable, Curried Lentil, Alphabet … and will update here as we trial them. 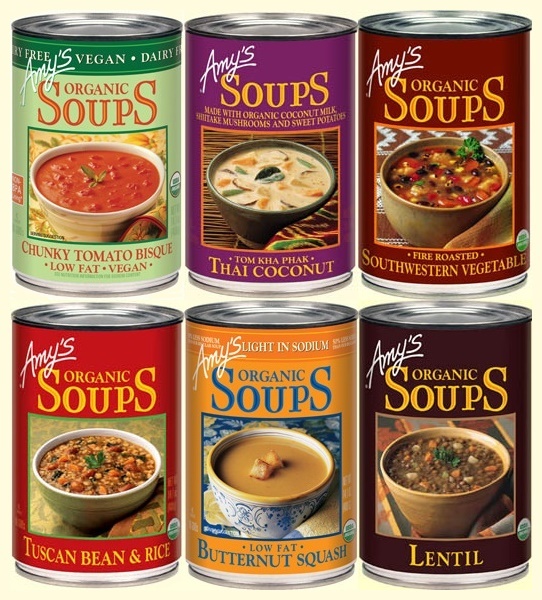 Certifications: Many varieties of Amy’s Organic Soups are Certified Organic, Certified Vegan, and Certified Kosher. Check each can for specifics. Dietary Notes: By ingredients, select varieties (varies by type) of Amy’s Organic Soups are dairy-free / non-dairy, egg-free, gluten-free, grain-free, nut-free, peanut-free, soy-free, vegan / plant-based, and vegetarian. Nonetheless, verify on the label and check with the company on their manufacturing processes for all varieties if potential allergen cross-contamination is an issue for you. Processes, ingredients, and labeling are subject to change at any time for any company / product. For More Product Information: Visit the Amy’s website at www.amys.com. My wife and I have been generally underwhelmed by this manufacturer of soup. We often look for organic options and have tried several of Amy’s offerings. The butternut squash soup being the worse example. It is a very watered down soup with barely a hint of squash. It has an oily texture and very bland. Amy’s Cream of Tomato soup is less disappointing, although more sugar than other healthy choices. We always expect to pay more for good organic offerings but Amy’s , in our opinion, is lass of a value and often comes up short. 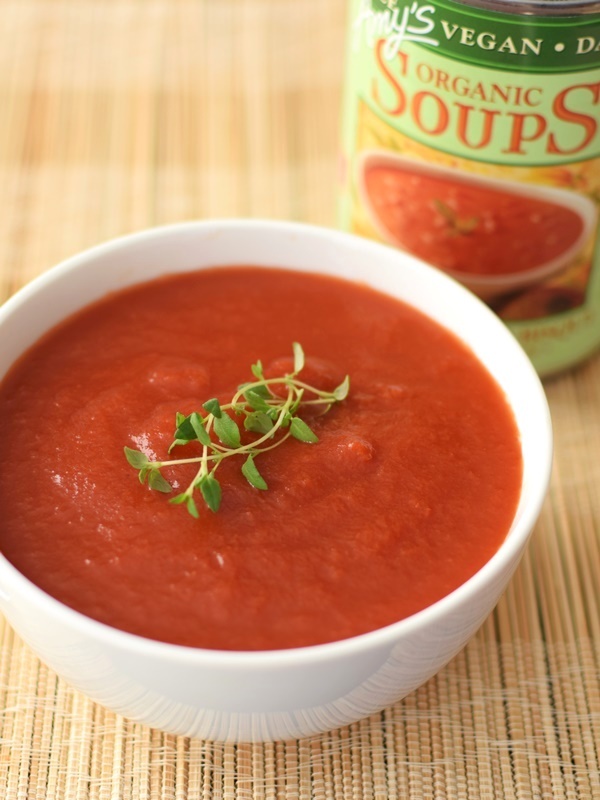 My son who is a New York foodie, just turned me onto Amy’s Chunky Tomato Bisque! OMG, it is delicious. I am not one who is partial to soups, but this one and Bar Harbor Clam Chowder (because I’m from Boston) are just so good that I don’t have to make them myself anymore. I never eat soups in restaurants or canned soups. I always make my own, but these two cut it for me. I’m going to try Amy’s coconut soup and chili. Maybe I can cross off two more on my cooking list! My amys fire roasted vegetable soup had black spots on the corn.. is this normal? 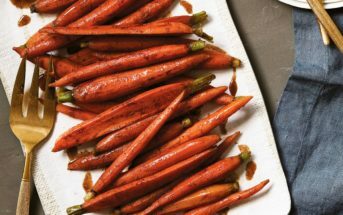 You’d need to check with the company to confirm, but roasting can create black spots on vegetables. See their store locator – https://amys.com/where-to-buy – or contact them directly via their website to find out stockists. Good luck, I hope you find it! Haha, that’s awesome Cindy. I can eat a whole can, too! Thanks for sharing this. Honestly, I rarely see coupons for Amy’s, but I bet if you sign up for their newsletter you’ll receive some periodically. I’ve found that Amy’s lentil soup always serves me best when I throw a few spices in. My favourite thus far has been adding in black pepper (of course), cumin, a generous amount of turmeric, some curry powder, and a pinch of powdered garam masala. Those sound like marvelous additions! Thank you for sharing Anya. I’m actually not a huge soup person–mostly because I’m vegan and don’t like a lot of salt in my food–but I really enjoy Amy’s low-sodium Lentil Vegetable soup. Put that one on your list! I cooked up one chopped carrot, one small (unpeeled) red potato & one celery stalk and boiled all three chopped veggies together in a saucepan for a few minutes and then drained all of the water out and added 2 cans of Amy’s Lentil Soup and brought that to a boil, served it and told everyone it was homemade soup. I tried Amy’s lentil Soup and it was delicious!!!!! …. I highly recommend it. It tastes just like my home-made Lentil soup that everyone raves about, but that I don’t have time to make. I just added one tablespoon of purified water and a pinch of sea-salt to suit my tastes and it was great. And, I didn’t even have to take an aspirin with it, like other canned soups…. MSG gives me a headache, without fail. There is no hidden MSG in Amy’s soups. I know that for sure b/c I haven’t gotten a headache from eating her soup. I will try the others soon and post back here. Thanks for sharing your feedback Jan! You might want to send your complaint to Amy’s Kenneth. This is a third party product review, I have no affiliation with them. This is great to know. I hadn’t seen that there was a dairy-free variety of her soups. I wish she’d come out with a cream of… soup that could easily replace cream of chicken soup, etc. 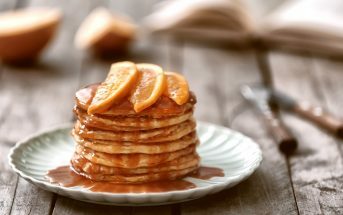 in recipes! I know, wouldn’t that be nice!